Boy, I bet you guys thought I forgot how to paint furniture. I admit I’ve been a little busy decorating the house for Christmas for the 12 Days of Christmas Home Tour. Not to mention that my finals for this semester start today!!! 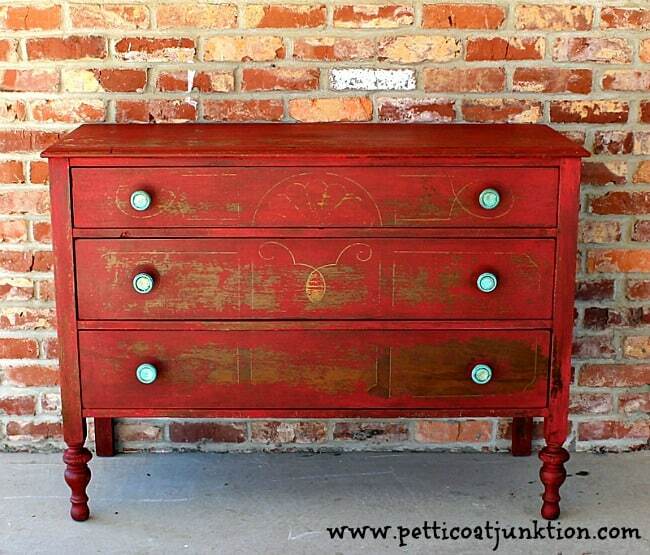 This dresser is such a yummy color…. MMSMP Tricycle Red …..it has Christmas present written all over it! But as you can see it was a mess when I brought it home from My Favorite Junk Shop. My wonderful husband, the Junktion Technical Specialist, cut new drawer bottoms to replace the two that were missing. For this makeover I used I applied a coat of dark wax to deepen the color a little. And for the finishing touch….turquoise knobs from Hobby Lobby. 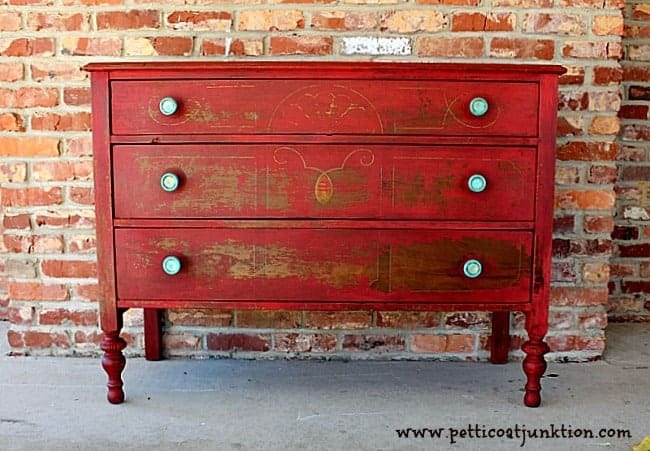 1.Miss Mustard Seed’s Milk Paint in Tricycle Red.…most viewed and most pinned of my projects on Pinterest. Do you like it?…some people don’t like the chippy look…..that’s ok. This is lovely! Well done! Sometimes people make the wrong color choice for the piece style but this is spot on! You should be proud of it! 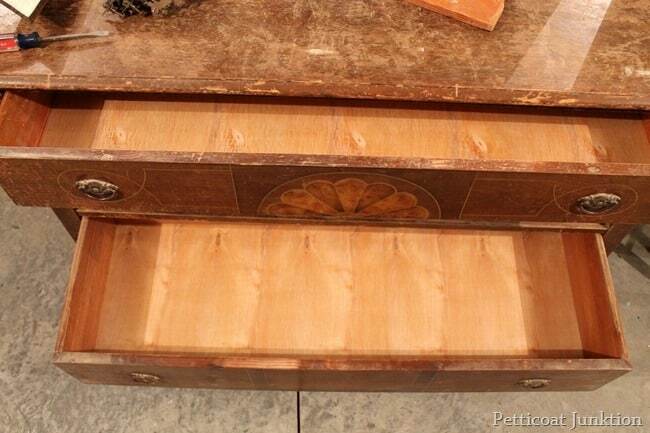 It looks like it aged that way naturally….I think it is “feature” worthy for sure! Gorgeous transformation as always! Can’t wait to see what you do next. I really love it especailly how you were able to keep the original design on the wood. Love it! Also love the original design work showing thru, would die to have something like this in my house. I dearly love this. Tomorrow is my first effort and I am a little nervous. Sure hope that mine looks half as FINE as yours turned out! Thanks for showing us your thing of beauty! LOVE!!!!!! Super Fabulous!!! I’m brand new to this, but am anxious to get started painting some old furniture! If I have a piece that is that slick veneer finish, would I need to sand it first to use this technique? Also, what is this ‘wax’ that you put over it? Thank you for an amazing blog! Red being my favorite color, this is the one I want to try first! 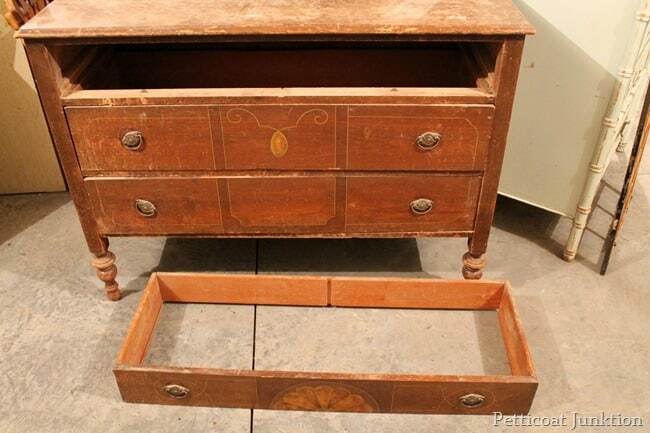 Love the dresser! Great Job! Love the red!! And love that you can still see some of the design in the wood through the paint. Perfect!!! Wow! You sure have been busy with all the tours! The dresser looks gorgeous — as always! I love this finish. I’m a big, big fan of furniture painted or stained red. Great job. If you study as hard as you paint I know you are acing your classes. Try hard for some time to breathe. As always you did great on this one. Love how the original design came through with just a hint! Good luck on the finals! Have a java good time…. Love the color!!!!! My next MMS color. I have a corner unit I want to redo for the dining room. Love the Tricycle Red! That chest would be a great Christmas present!! 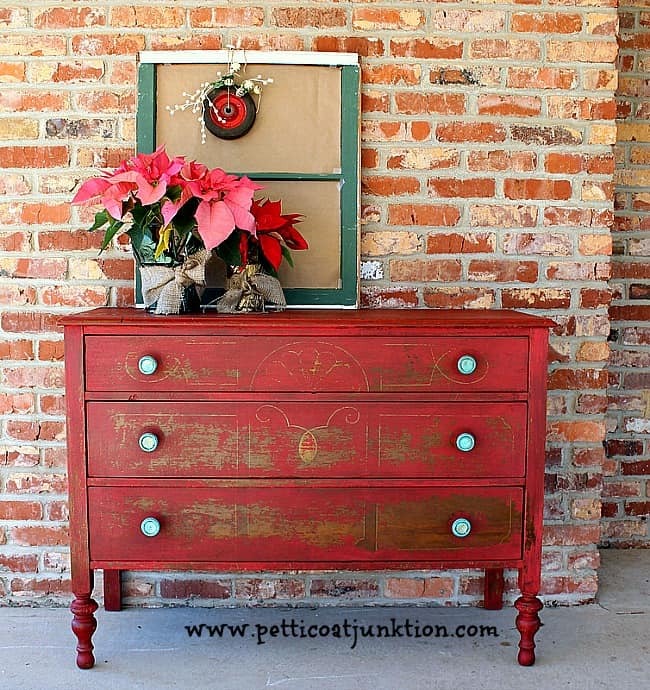 This dresser looks so pretty! I’d be a basket case if I had to take finals. Good luck! Where were you when I lived in Clarksville, lol? Wow, what an awesome makeover!!! I love it! Rock on, Kathy! Love love love the color!!! My fav! Great transformation, thanks for sharing Kathy. Enjoy your Blog! Merry Christmas!! love it!! I will be doing some old castoff furniture painting this winter…thanks for all the good ideas, and I love the knobs and drawer pulls Hobby Lobby sells!! !